The dry, bleak and unyielding landscape of Kutch in Gujarat has many stories to tell. One of them is the story of craftsmanship of needle and thread embroidery women living here hold close to their hearts. 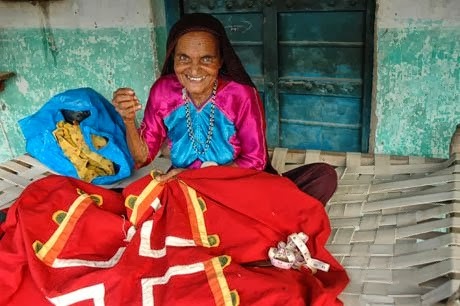 Women of Kutch can weave magic using colorful threads, beads, mirrors and paints. I love the exquisite embroidery of the region. So when I found out about Stitching Stories, a children’s book that celebrates the craft and its people, I couldn't resist picking up a copy. Browsing the text, I quickly realized that the book wasn't just about crafts and embroidery. It was about war, earthquake and refugee camps. It was also about building resilience, working together, and friendship. The narrative chronicles the real-life story of Raniben and Meghiben. The first half of the story brings the voice of Raniben and the second, Meghiben. 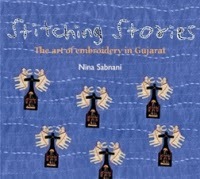 Using details from the cloth as illustrations, author Nina Sabnani shares their life experiences whose work is their entire life story captured in needlework. We find out within the first few pages that war forces Raniben to flee Pakistan. Crossing the harsh desert, she finds shelter in a refugee camp in a village called Jurra in Gujarat. 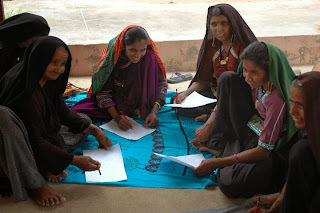 There, her husband runs a school to teach her son, Prakash and other children. After eight years, they move again. "I think about my work at night, says Raniben. It is peaceful and quiet then. I think of my village, Adigaam, now in Pakistan. This is a map of my village. I made it to show my friends where I came from. Meghiben says she knows about my past through my work." When earthquake tore the region apart, everything was lost again. Homes had to be rebuilt. Meghiben talks about the earthquake and how everything changed after that including their art. The two women and others like them from the surrounding villages work at Kala Raksha, a craft organization that preserves age-old embroidery traditions, while supporting artisans through income-generation projects. The text is quiet and subdued. It is the needlework and patterns and motifs that supplement the cataclysmic accounts the two women so nonchalantly narrate. Notes about the people, their embroidery traditions and the lives of different groups working together is covered in detail at the end of the book. Intricately composed, painstakingly stitched by hand, Stitching Stories is a folk-art masterpiece that deftly treats a difficult subject in a sensitive way. More power to children's literature which celebrate storytelling revolving around resilience shown by real-people in the face of adverse scenarios of migration. Long live their livelihood traditions they strive hard to preserve for themselves and others around them. What an interesting pick Praba ! 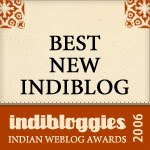 Loved your review and I am quite eager to pick this book, after reading the review. I am always impressed when people find such creative ways to narrate stories. had goosebumps reading this, thanks for highlighting a book that celebrates beautiful and underrated folk art. A lovely review of a well loved book. I have some well-loved pieces of this work by Shrujan. Exquisite. Looks very interesting! Love your theme for this year and the way you've picked up so many interesting and varied books and reviewed them for the same.